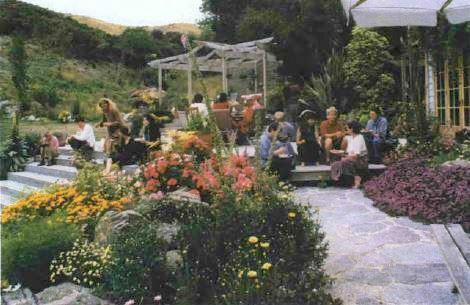 Weed salads from a healing garden are an integral part of lunch at Chandrakirti Centre in Nelson, New Zealand. Phillipa Rutherford reports. Set among picturesque rolling hills with a view to the mountains, Chandrakirti Tibetan Buddhist Centre has trees, and flower, herb and vegetable gardens spread over its two acres of lawn. We run herbal classes, teaching people how to identify and use local plants for food and healing. We make herbal ointments, teas, tinctures and vinegars and educate our visitors in the ways of natural living. The gardens compete with chicory, dandelion, fennel and kale for space. Calendulas abound in the spring as does plantain, chickweed, motherwort, a variety of mints and dozens of other wonderful nourishing plants. The herb gardens are teaching areas, where folk are encouraged to be part of their own healing by reconnecting with the earth and the elements. We call our herbal healing business Wise Women Healing. Karen Neame and I make remedies to sell; we see private clients offering treatments in naturopathy, herbal remedies, massage, Bach flowers and life skills education. Large rockeries full of flowering perennials with a spacious deck and lawn area flourish in the front garden. It’s like being in a pure land – the grounds are so lush and full of flowers and beauty. We have been part of local garden trails where the public can come to view and enjoy the place.